January 12, 2018 , Auburn Hills, Mich. – Dodge//SRT and the Bob Bondurant School of High Performance Driving announced today a new performance-packed one-day drag racing class, featuring the 840-horsepower 2018 Dodge Challenger SRT Demon – the most powerful muscle car ever. The new “Dodge//SRT Bondurant Drag Racing School” complements Bondurant’s already successful “Official High Performance Driving School of Dodge//SRT” class provided to all customers who buy an SRT model vehicle and includes both classroom instruction and on-track performance driving. 2018 Dodge Challenger SRT Demon owners have the opportunity to participate in either one of these full-day classes at no additional charge. In addition to the Challenger SRT Demon, the new drag racing course will also feature other Dodge high-performance vehicles, including the 707-horsepower Dodge Challenger SRT Hellcat and Hellcat Widebody, and the 485-horsepower Dodge Challenger SRT 392. Pre-registration for the “Dodge//SRT Bondurant Drag Racing School” begins January 12, with the first class starting March 9. Demon and SRT owners register for the class through the Dodge//SRT concierge line, 800-998-1110, as their vehicle identification numbers will be verified. All others register at Bondurant.com/dragracing. Owners of other Dodge//SRT vehicles, who already receive a full-day high performance driving class, can upgrade their training to two full days (one-day road course, one-day drag strip) for $999. Non-Dodge vehicle owners can also take the drag racing class for $1,999 to learn the art of drag racing and experience the Challenger SRT Demon, SRT Hellcat, Hellcat Widebody and SRT 392. The “Dodge//SRT Bondurant Drag Racing School” will be held at Bondurant’s world-class facility and the Wild Horse Pass Motorsports Park, an official NHRA drag strip, which sit on approximately 200 acres in Chandler, Arizona. The new program is a part of Bondurant’s Golden 50th Anniversary in 2018 and is a collaboration with Dodge, Goodyear, Shell and Pennzoil. Classroom instruction for the full-day school will last approximately two hours and will address the fundamental rules of drag racing, including proper launch, staging technique, reaction time, signals and safety pre- and post-checks. On-track instruction will be under the direction and supervision of a professional Bondurant instructor. Each student will get 22 single-lane runs, including a wet-box burnout, stage, 60-foot pass, half-pass and full-pass, in a variety of Challenger models. 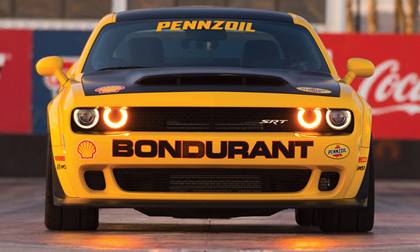 As the official automotive lubricant and fuel supplier of Bondurant Racing School, Shell / Pennzoil is lending additional star power to the new drag racing school. Leah Pritchett, an NHRA Top Fuel dragster driver for the Mopar, Dodge and Shell / Pennzoil brands, served as a consultant on the new program. A promotional video of the new “Dodge//SRT Bondurant Drag Racing School” and images can be viewed at Bondurant.com/dragracing and downloaded at the Dodge Garage, the Dodge brand’s digital content hub and premier destination where muscle car and race enthusiasts can hang out to get the latest on all things Dodge//SRT and Mopar. From high performance driving classes to racing preparation and law enforcement training, Bondurant has a program that improves skills for anyone. To learn more about Bondurant’s Drag Racing programs, as well as its other classes, please call 1-800-842-RACE, or visit www.Bondurant.com. The Bob Bondurant School of High Performance Driving and Bondurant Racing School, which is located in Phoenix, Arizona, is the only purpose-built driver training facility for performance enthusiasts and is the largest driver training of its kind in the World. At the heart of the 100 acre facility is a 3-mile, 26 turns and 11 multi configuration track that was designed by Bob Bondurant. The school maintains over 200 race-prepared vehicles, sedans, SUVs and open wheel cars. For more information, visit www.Bondurant.com or call (800) 842-RACE. Dodge//SRT offers a complete lineup of performance vehicles that stand out in their own segments. Dodge is FCA North America’s mainstream performance brand, and SRT is positioned as the ultimate performance halo of the Dodge brand, together creating a complete and balanced performance brand with one vision and one voice. For more than 100 years, the Dodge brand has carried on the spirit of brothers John and Horace Dodge, who founded the company in 1914. Their influence continues today. New for 2018, the 840-horsepower Dodge Challenger SRT Demon, the fastest quarter-mile production car in the world and most powerful muscle car ever, is taking the world by storm, along with the new 2018 Dodge Durango SRT, America’s fastest, most powerful and most capable three-row SUV, and the 707-horsepower Dodge Challenger SRT Hellcat Widebody. These new SRT ultimate performance models join a brand lineup that includes the Durango, Grand Caravan, Journey, Charger and Challenger, including the 707-horsepower Challenger SRT Hellcat and the Charger SRT Hellcat, the quickest, fastest and most powerful sedan in the world.